Arriving in Sharm el-Sheikh on the eve of the conference, the Aga Khan was welcomed by the Governor of South Sinai, Major-General Khaled Fouda and Secretary General of the Egyptian Agency of Partnership for Development, Ambassador Dr Hazem Fahmy. Later he met President Sisi of Egypt. 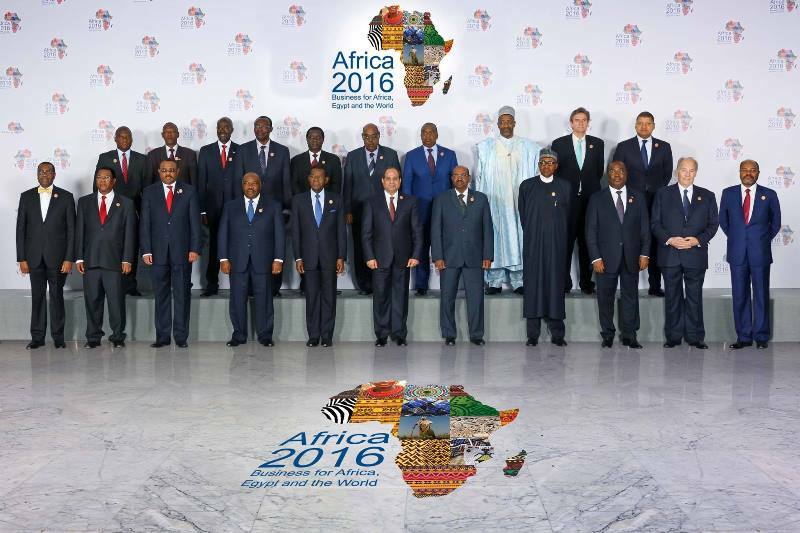 Africa 2016 is held under the high patronage of H.E. Abdel Fatah el Sisi on 20-21 February 2016 in Sharm el Sheikh, Egypt, and is organized by the Ministry of Investment, Ministry of Foreign Affairs, Ministry of Industry and Foreign Trade, and Ministry of International Cooperation, in partnership with the Egyptian Agency of Partnership for Development and COMESA Regional Investment Agency, and under the umbrella of the African Union Commission. It gives me a great honour and pleasure to host Africa 2016 Forum, a landmark platform that will bring together a wide range of the foremost political and business leaders in Africa and across the world to discuss ways of enhancing pan African international trade and investment and promoting business climate with a major focus on the role of the private sector. The theme of the forum is business in Africa, whether we speak of African business in Africa, international business in Africa as well as international business through Egypt in Africa, “Africa 2016” will turn a spotlight on the success stories of the continent, will draw lessons from the past and will showcase key achievements while looking forward to the future. Africa’s economic prospects are bright and remarkably growing. “Africa 2016” presents an invaluable opportunity to explore new ways to leverage its growth potential and to engage in rich discussions, productive meetings and enlightening sessions on how to accelerate investments, create more jobs and sustain development. My country is committed to Africa and will spare no efforts to extend and strengthen ties and integration across all African Countries in order to help it drive its economic and social development. “Africa 2016” following the historical launch of the Tripartite Free Trade Area (TFTA) between COMESA, EAC and SADC, on June 10th in Sharm-el-Sheikh, is a testimony of Egypt’s keen determination to enhance trade and investment in our beloved continent. I look forward to meeting you all on 20th and 21st February 2016 in Sharm-el-Sheikh at Africa 2016. What a great pleasure it is for me to be part of the Africa 2016 Forum. I thank President Sisi, most warmly, for his kind invitation. What a wonderful opportunity to meet with old and new friends, from all over the world, and to talk together about Africa’s future. My enthusiasm today is especially strong because of the message which is at the heart of this Forum. And that message is, quite simply, that Africa’s Moment has come. I am proud to add my strong endorsement to that statement. To be sure, and to be realistic, serious challenges confront the African peoples. One example is the enormous problem of unemployment among the young - in countries with the highest percentage of youth in the world. But the story of Africa’s progress and potential is also impressive – whether we talk about growing GDP and foreign direct investment, whether we look at economic diversification and national resiliency, whether we chart the role and the rise of a vital middle class - and the expansion of consumer spending - now breaking through the one trillion dollar mark. The experience of our Aga Khan Development Network supports this positive picture. We are now active in 13 African countries, in fields ranging from health and education, to travel and hospitality, from food and clothing companies to banking and finance, media and culture. Many of these involvements go back several decades - with some ups and downs, of course. But as we look at these experiences on the ground, we can say with conviction that Africa’s moment has come. What supports that statement, however, is not only economic data. My own optimism is also based on intangible qualities, including an inspiring new spirit of African confidence. What I see emerging today is a refreshingly, balanced confidence in Africa - a spirit that takes encouragement from past progress, while also seeking new answers to new challenges - understanding that the best way to move into the future is to walk hand-in-hand with partners who share one’s goals. And we are all here to fulfil that role. I highlight the part played by confidence because it addresses a problem that has long plagued the human race. I refer to the fear we so often have that our environment will be controlled by others, to the point where we distance ourselves from potential worthy partners. This difference can extend to people of different ethnic groups, different tribes, different nationalities, different religious traditions. It can also extend to people with different political or economic loyalties. And the frequent result is a fragmenting of society, a breakdown of cooperation, an undercurrent of fear, and even a paralysing polarisation in our public life. It can be a distinctly disabling environment. The problem of fragmentation has often afflicted Africa, separating tribe from tribe, country from country, the private sector from the public sector, those who hold political power from those who are in opposition. In such cases, the fact of being different is often seen as a burden, or a threat, a source of fear and suspicion. But there is another way to look at our differences. What a wonderful, liberating thing it would be if more of us, more of the time, could see diversity not as a burden but as a blessing; not as a threat, but as an opportunity. I believe this changing attitude toward diversity is now happening in Africa, in part because of a new sense of African confidence. We see more cooperation today across tribal and religious lines, across political divisions and national boundaries. One powerful example was the tripartite trade agreement signed here in Sharm el-Sheikh last June. And we have also seen new forms of cooperation among people in the private and the public sectors. The concept of Public Private Partnerships has been a keystone for many of our own Network’s projects in Africa and elsewhere. Cooperating across traditional lines of division does not mean erasing our proud, independent identities. But it does mean finding additional, enriching identities as members of larger communities, and ultimately as people who share a common humanity. It means committing ourselves to an Ethic of Pluralism. By Civil Society, I mean that range of social activity that does not stem from private business organizations, nor from governmental authority. The institutions of Civil Society are motivated, rather, by voluntary energies, and their purpose is to improve the quality of community life. They are private institutions, devoted to the public good. When I speak of a vital Civil Society I think of path breaking efforts in the field of education, from early childhood to advanced post-graduate programs. I think of health-related innovators, whether they are extending quality maternal and natal care or creating new tertiary care facilities. I think about efforts to advance the arts and culture, to improve environmental quality and foster scientific research. Civil Society includes a host of professional, labour, ethnic and religious groups and a broad array of non-governmental organizations – NGOs - as well. I focus on Civil Society because I think its potential is often under-appreciated as we become absorbed in debates about the most effective programs of governments and others, or the most successful business strategies. But, in fact, it is often the quality of the third sector, Civil Society, that is the “difference-maker”. It not only complements the work of the private and public sectors, it can often help complete that work. In sum, I believe that social progress will require quality inputs from all three sectors: public, private and Civil Society. Sustainable progress will build on a three-legged stool. And that progress can be particularly impressive when the three sectors work closely together. One prominent example of such cooperation that I know well is the Bujagali dam in Uganda - a project in which our Economic Development Fund has joined with the government of Uganda, and a private investment fund based in the United States. All three sectors; public, private and civil society have jointly created this project which, after just three years, provides nearly half of Uganda’s electric power. Another example is the National Park of Mali - opened in Bamako in 2010 - when our Trust for Culture partnered with the national government to create not only a glorious green space, but also an infrastructure which ensures the Park’s long-term sustainability. A third example is our own Network’s East African educational initiative, in which we now invest 10 million dollars a year, reaching some 400,000 students and 6000 teachers, and again working closely with government education offices and local community organizations. The examples could go on and on. But, despite such successes, the role of Civil Society is often misunderstood or taken for granted. At times, Civil Society has been marginalized, discounted, or dismissed. One worrisome development has been the dwindling of international support, some two-thirds of sub-Saharan countries face a reduction in development assistance by 2017. Even more disturbing have been efforts in some places to constrain or even repress these institutions, stereotyping them as illegitimate, unelected and unaccountable. These attitudes may simply reflect a reluctance to share power and influence, or perhaps a feeling that the creative energy and sheer diversity of Civil Society is daunting and dangerous. Such attitudes have been exceptional, but they are highly regrettable, discouraging the qualities of vision, innovation and forward thinking that progressive societies so badly need. But there is good news too. For, at a fundamental level, the cultures of Africa bode well for the future here of a vibrant, healthy Civil Society. For centuries, African life has been characterized by a vast array of indigenous informal groups, sustained by citizen donations and voluntary service. They include ethnic and kinship groups, councils of elders, religious bodies, and community fora. Many Africans have grown up amid such groupings, learning to emphasize their mutual interests, to pool their resources, and to share in shaping their local communities. It is part of the African Way. The influence of Civil Society has also been felt at seminal moments in the continent’s recent history, for example: in shaping the Arusha Accords which recently ended 12 years of civil war in Burundi, in the peaceful resolution of the violent clashes in Kenya following the 2007 elections, in the drafting of a new promising Tunisian Constitution, and in the courageous response to the Ebola crisis. I think too of how sophisticated young Africans have been incubating noteworthy internet-based ventures to expand and coordinate a range of civil society ventures, with high social impact. In conclusion, there are many reasons to believe that this is Africa’s Moment and that Africans will seize it. Among those positive elements is a growing sense of confidence that encourages Africans to work together across old lines of division, including cooperative engagements with the institutions of Civil Society. The growing vitality of Civil Society should be a key source of encouragement when it comes to investing in Africa. When it is advanced and enabled, it is the best underwriter of development. It can, I know, be a key force in seizing Africa’s Moment and making the most of it. President Abdel Fattah El Sisi met on Saturday 20/2/2016 with Aga Khan, the Chairman of the Aga Khan Development Network (AKDN), on the sidelines of the Africa 2016 investment forum in Sharm el Sheikh, Presidential Spokesman Alaa Youssef said. Sisi hailed the positive role played the AKDN which – he considered – as an example of non-governmental organizations contributing to development in the society and creating jobs. The president hailed the AKDN foundation's efforts in Egypt, especially in the childhood development projects. Aga Khan said he is looking forward to boosting the foundation's activities in various Egyptian cities, referring to the foundation's projects in Aswan. He added that the foundation plans to finance more projects for the needy segments, especially in the health and educational sectors. 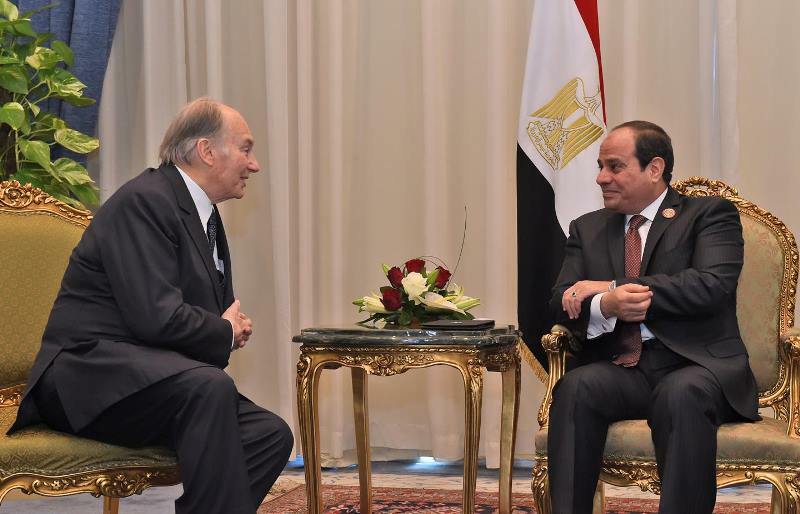 The spiritual leader of Shia Ismaili Muslims Prince Shah Karim Al Hussaini Aga Khan focused on the vital role of Civil Society in his address during the ‘Africa 2016: Business for Africa, Egypt and the World’ conference in Sharm el-Sheikh, Egypt. Offering his strong endorsement to the heart message of the forum ‘Africa’s Moment has come’, Prince Aga Khan said serious challenges confront the African people, citing unemployment among the young in the countries with the highest percentage of youth in the world as one of the examples. However, he said the story of Africa’s progress and potential is also impressive including the growing GDP and foreign direct investment, economic diversification and national resiliency, the role and the rise of a vital middle class and the expansion of consumer spending, which is now breaking through the one trillion dollar mark. He pointed towards the emergent balanced confidence in Africa and new forms of cooperation among people in the private and the public sectors. Prince Aga Khan said his focus on Civil Society was because its potential is often under-appreciated as we become absorbed in debates about the most effective programs of governments and others, or the most successful business strategies. “In sum, I believe that social progress will require quality inputs from all three sectors: public, private and Civil Society. Sustainable progress will build on a three-legged stool. And that progress can be particularly impressive when the three sectors work closely together,” he concluded. Prince Aga Khan said one prominent example of such cooperation is the Bujagali dam in Uganda — a project in which the Economic Development Fund of the Aga Khan Development Network has joined with the government of Uganda, and a private investment fund based in the United States. All three sectors; public, private and civil society have jointly created this project which, after just three years, provides nearly half of Uganda’s electric power. Sharm el-Sheikh, Egypt. His Highness The Aga Khan, has commended Africa's resilience, economic progress and new willingness to accept diversity. "What I see emerging today is a refreshingly balanced confidence in Africa - a spirit that takes encouragement from past progress, while also seeking new answers to new challenges," said the Spiritual Leader of the Shia Ismaili Muslims in his keynote address to the "Africa 2016: Business for Africa, Egypt and the World" conference, hosted by Egypt's President Abdel Fattah el Sisi. The Aga Khan noted the decidedly upbeat spirit about Africa's economic future that emanated from the speeches of African leaders taking part in the conference. "My enthusiasm today is especially strong because of the message which is at the heart of this Forum. And that message is, quite simply, that Africa's moment has come," he declared. While cautioning that Africa still faced formidable challenges, including high unemployment levels among the continent's young people; he said that the continent had made significant progress in a number of key areas. "The story of Africa's progress and potential is also impressive - whether we talk about growing GDP and foreign direct investment, whether we look at economic diversification and national resilience, whether we chart the rise of a vital middle class - and the expansion of consumer spending - now breaking through the one trillion dollar mark," he said. The Africa 2016 Forum, which concluded in Sharm el Sheikh called for greater trust and cooperation, between government and the private sector but also between African businesses to look beyond their borders for partners and opportunities. 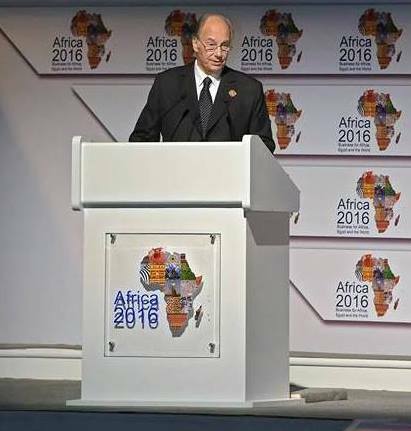 His Highness Aga Khan, Chairman of the Aga Khan Development Network opened day two of the Africa 2016 Forum with a keynote address that highlighted the African opportunity as well as the need to build layers of trust. During a frank interview style debate, Carlos Lopes notes that the Africa Rising story is not an African construct but a foreign narrative based on a few successful trends that do not take into account the lack of transformation of Africa’s economies. Throughout the Forum, it was agreed that Africa’s long-term success is underpinned by strong demographics, rapid urbanisation and the digital revolution. But if there is an opportunity it is because there is a lot to do. And that this responsibility and leadership to change the continent is no longer about heads of state alone. This leadership in Africa is widespread and is not just about a few individuals: it includes the private sector, civil society, individuals in academia, as well as innovators. Attended by 8 African presidents, 54 ministers and numerous public figures, Mawlana Hazar Imam, a keynote speaker on 21st February, 2016, was described as “the greatest investor in Africa" (Akhbar Arabia) at the Africa 2016 investment forum in Sharm el-Sheikh, Egypt. In his address, Mawlana Hazar Imam focused on the vital role of civil society. He also spoke about the story of Africa's progress and described that Africa’s “potential is also impressive, including the growing GDP and foreign direct investment, economic diversification and national resiliency, the role and the rise of a vital middle class and the expansion of consumer spending”. At the invitation of Egypt’s President, His Excellency Abdel Fattah el Sisi, His Highness Prince Karim Aga Khan delivered the Keynote Address at the Africa 2016 – Business for Africa, Egypt and the World conference on Sunday 21st February. AKDN presents highlights of the conference in the YouTube below. “The experience of our Aga Khan Development Network supports this positive picture. We are now active in 13 African countries, in fields ranging from health and education, to travel and hospitality, from food and clothing companies to banking and finance, media and culture. Many of these involvements go back several decades – with some ups and downs, of course. But as we look at these experiences on the ground, we can say with conviction that Africa’s moment has come. 49th hereditary Imam of the Ismaili Muslims.